Kavala is regularly connected by ferry to the islands of Limnos and Agios Efstratios. Moreover there are also some itineraries per week from Kavala to the Greek islands. During the winter there are 2-3 ferries per week from Kavala to Lemnos. During the summer these itineraries get a bit denser reaching a level of 3-4 ferries per week, The trip from Kavala to Lemnos lasts 4-5 hours and it is operated by conventional ferries that can carry vehicles. The port of Kavala is also connected to some other Greek islands with one or two itineraries per week. An estimated travel time from Kavala to Mytilene, Chios and Samos lasts 8, 11 and 15 hours. The trip from Kavala to Ikaria lasts 16 hours. All the aforementioned trips are operated with conventional ferries that can carry cars and other vehicles. As the trip duration is quite large, we would suggest you to book a cabin! 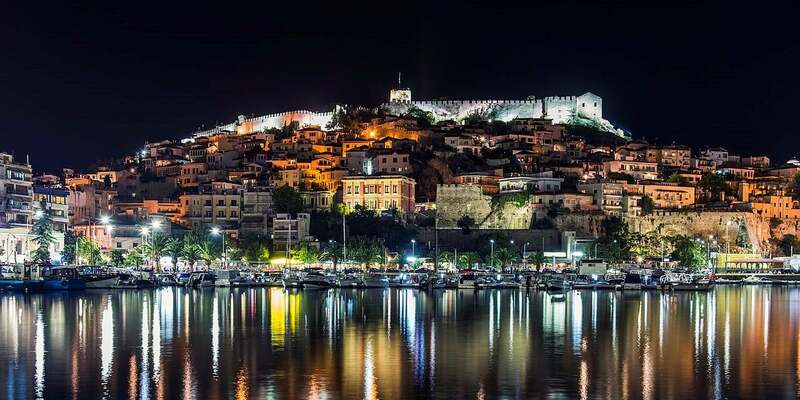 Kavala is one of the most beautiful cities of northern Greece. It is a excellent city to enjoy very nice beaches and extraordinary hiking routes. Kavala is one of the few Greek cities that have 4 organized beaches inside the urban area. A bit further you may find the organized and non-organized beaches of Paliou, Neas Iraklitsas and Nea Peramos. In the eastern side of the city, you may find the beaches of Pergialos, Aspri Ammos and Nea Karvali.